Successfully Added LUNSY LED Motion Sensor Under Cabinet Night Light USB Rechargeable Stick to your Shopping Cart. DURAL WORKING MODES: Set it to "Auto" position to be motion activated, or set it to"on" position to light on constantly. Different mode for different occasions and needs. MOTION ACTIVATED NIGHT LIGHT: The light lights up automatically when it detects the human movement within 3m(120 degree), then it about turns off 15s thereafter once you are not in the sensor range. RECHARGEABLE CLOSET LIGHT: Built in lithium battery with 600mAh capacity can be recharged with a provided USB cable. No electric wire, no need to replace batteries frequently and one full charge provides up to approx 500 times of sensing at full brightness. SIMPLE INSTALLTATION WITH AN ADHESIVE TAPE: Quickly mount the magnetic strip to any flat surface with the 3M adhesive tape. Then you can attach the closet light to the magnetic bar or take it off the magnetic bar for recharging. 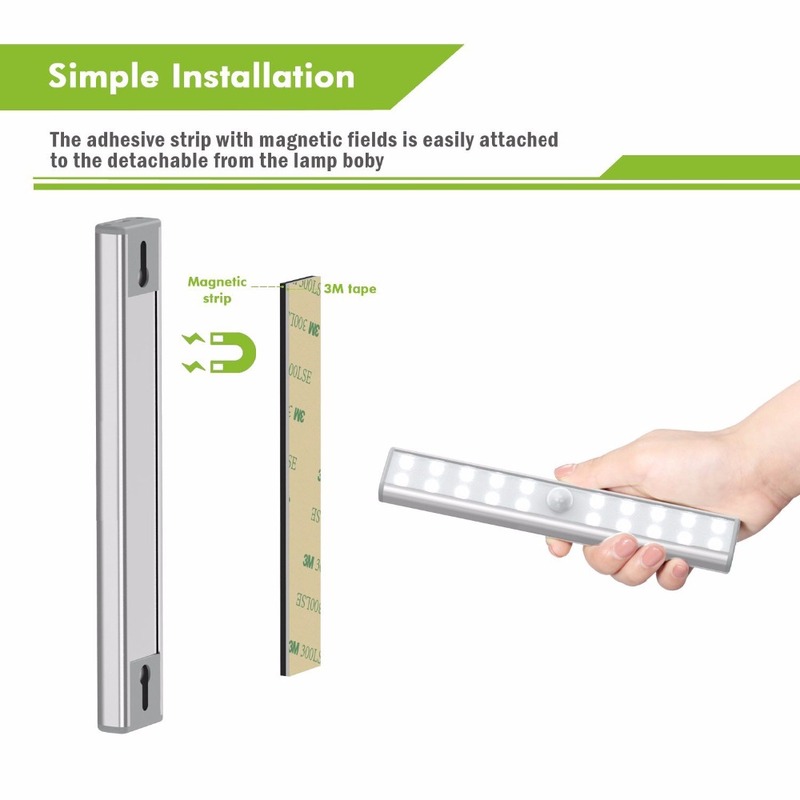 WIDE APPLICATION: With 20 LEDS super bright LEDs, it can provide sufficient light for closet, cabinet, under counter, pantry, basement, bedroom, baby room, garage, doors, drawer,etc. Contains 20 energy-saving LEDs to illuminate the closet, cabinet, under counter, pantry, basement, bedroom, baby room, garage, doors, drawer, etc. Firstly, simply stick the magnetic bar to the surface with the adhesive strip on the back of magnetic bar. Secondly, casually attach the motion sensor light to the magnetic bar. Built-in 600mAh battery which can be recharged via Micro USB port. A USB cable is provided. Automatically senses human motion to light on. Or choose to light on the light constantly. The light will not light up in well-lit environment.